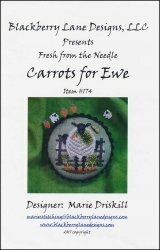 Carrots for Ewe [C5663] - $13.00 : Yarn Tree, Your wholesale source for cross stitch supplies. Cross stitch pattern by Blackberry Lane Designs. A hungry sheep is eating her carrots! Standing in the middle of this design is an Ewe eating her carrots. A fence stands behind her with other sheep looking onward. Stitch count is 52w x 53h.